The Global Volcanism Program has no activity reports for Goodenough. The Global Volcanism Program has no Weekly Reports available for Goodenough. The Global Volcanism Program has no Bulletin Reports available for Goodenough. Goodenough is a roughly circular volcanic island that is the westernmost of the D'Entrecasteaux Islands off the NE tip of Papua New Guinea. Several basaltic-andesite and andesitic Holocene eruptive centers are located around the margins of fault-bounded metamorphic rocks that form the central part the island. The youngest volcanic features, which include the Walilagi Cones, are located at the SE end of the island. These well-developed ash cones and blocky lava flows on the N and E flanks of the Bwaido Peninsula may have erupted within the past few hundred years. Smith I E M, 1981. Young volcanoes in eastern Papua. Geol Surv Papua New Guinea Mem, 10: 257-265. The Global Volcanism Program is not aware of any Holocene eruptions from Goodenough. If this volcano has had large eruptions (VEI >= 4) prior to 10,000 years ago, information might be found on the Goodenough page in the LaMEVE (Large Magnitude Explosive Volcanic Eruptions) database, a part of the Volcano Global Risk Identification and Analysis Project (VOGRIPA). There is no Deformation History data available for Goodenough. There is no Emissions History data available for Goodenough. Goodenough (center) is the roughly circular volcanic island that is the westernmost of the D'Entrecasteaux Islands in this NASA satellite image with north to the upper right. Several Holocene eruptive centers that may be only a few hundred years old are located around the margins of fault-bounded metamorphic rocks that form the central part of Goodenough Island. 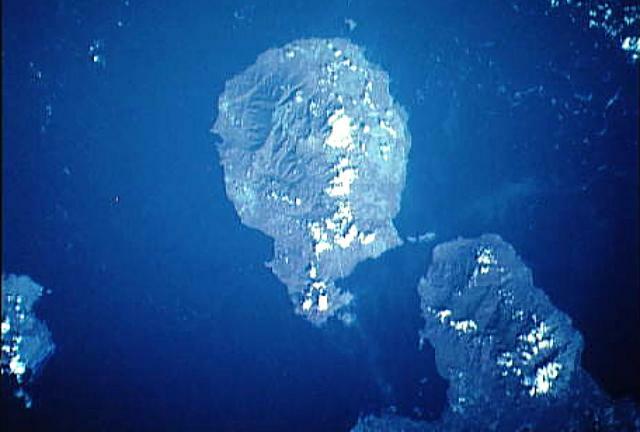 The youngest volcanic features, which include the Walilagi Cones, are located at the SE end of the island on the Bwaido Peninsula (lower center). NASA Space Shuttle image STS44-83-79, 1991 (http://eol.jsc.nasa.gov/). There are no samples for Goodenough in the Smithsonian's NMNH Department of Mineral Sciences Rock and Ore collection. Large Eruptions of Goodenough Information about large Quaternary eruptions (VEI >= 4) is cataloged in the Large Magnitude Explosive Volcanic Eruptions (LaMEVE) database of the Volcano Global Risk Identification and Analysis Project (VOGRIPA).